Taking to the tracks of India's extensive railway system, we travel from the the Northern Sikh city of Amritsar to Kerala's beautiful backwaters. Along the way we discover Mughal treasures, search for Bengal tigers, relax on tropical beaches and wander through jungle-lined foothills. Our journey begins in Amritsar, a city at the spiritual heart of the Sikh religion, its magnificent Golden Temple providing a serene centrepiece to this most holy of cities. This evening you may wish to take the opportunity to visit the temple itself, to watch the reflective light of the moon playing across the tranquil waters that surround the main shrine, the Harmandir. The temple is home to the revered texts of the Sikh Holy Scriptures, the Guru Granth Sahib, and its gilded dome is covered in over 700kg of pure gold. A sumptuous fusion of Hindu and Islamic influences, the temple was the scene of the massacre of hundreds of Sikh protesters in 1984, when the Indian army, acting on the orders of the then Prime Minister Indira Gandhi, evicted extremists from the temple, an act that led to the assassination of Indira Gandhi by Sikh bodyguards later that same year. This morning we will pay a visit to the Jalianwala Bagh, site of the notorious massacre under General Dyer in 1919, which led to 379 Sikhs being shot from point blank range by British troops. This wholly unprovoked attack on a peaceful demonstration led to Gandhi's programme of civil disobedience and helped to galvanise India's burgeoning independence movement. We also visit the Golden Temple, where we need to make sure that we remove our shoes, cover heads and wash our feet before entering. The temple itself is a surprisingly small building surrounded almost entirely by tanks of holy water in which the Sikh pilgrims bathe (the name of the town itself comes from the Amrit Sarovar - the Pool of Nectar). The atmosphere is one of incredible calm, with devotees taking their turn to pass through the main shrine, where there is a continuous and melodic recital (known as the Akhand Path) from the Guru Granth Sahib. This afternoon there will be an excursion to Wagah Border to see the 'Flag Down' ceremony before we catch the overnight train, the Golden Temple Mail to Delhi. This morning we arrive in Delhi and transfer to our hotel. Late morning we will take a tour of Old Delhi by metro and cycle rickshaw. The former capital of the 17th century Mughal emperor Shan Jahan, the old city is a magnificent fusion of grandiose architecture and vibrant chaos, centred around the Chandni Chowk Bazaar, an eclectic cacophony of noise, colour and deafening barter that is so essentially Indian. Our sightseeing takes in the spectacular Jama Masjid Mosque, the largest in India and Shah Jahan's magnificent swansong. Taking 14 years to complete, the mosque is a majestic structure, featuring four towers, three gateways and two towering minarets that stand some 40m high. Built from sandstone and marble its vast courtyard can hold upwards of 25,000 worshippers and from the top of the southern minaret you can get a clear view of the colonial designs of Edward Lutyens across the city. After our tour we have left the rest of the day free, so anyone who wishes to continue exploring may do so at their own pace, taking in the vibrant atmosphere of this most Indian of cities before making their way back to the hotel. The Indian capital has long been a phoenix, rising again and again out of its own ruins and is essentially a city divided in two: a magnificent living monument to the grandiose designs of the Moghals and the British. New Delhi, the setting for this morning's tour, was the creation of the British Raj of the 1930s and its streets are filled with a rich collection of the architectural creations of Edward Lutyens. Following the broad expanse of the Rajpath (Kingsway), we will view the towering memorial arch of India Gate, a testament to the 90,000 Indian troops who lost their lives during WWI and the fighting along the Northwest Frontier during the early years of the 20th century. We will also view the imposing buildings of the Indian Parliament, as well as the Moghal majesty of Humayun's Tomb, a 16th century mausoleum commissioned by the emperor's Persian born wife and considered by many to be one of the best examples of Moghal architecture in the country. Our final visit of the day will be to the towering Qutub Minar, a spectacular 13th century edifice made of sandstone and marble that towers some 73m above the city and heralded the final demise of the Hindu kings and the arrival of the Muslim sultans. From here we will then drive straight to the city's Nizamuddin Station for the afternoon train on to Agra. This morning we have an early start as we head for the magnificence of one of the most universally recognised buildings on earth, and surely the greatest testament to love ever constructed. Built by the emperor Shah Jahan to honour the memory of his beloved wife Mumtaz, the building took some 22 years to complete and was once described by Rudyard Kipling as '…the embodiment of all things pure'. Built of marble and decorated with the most exquisite inlay work, the Taj Mahal required the labours of 20,000 men and is estimated to have cost something in the region of 3 million rupees (at today's prices that equates to around $70 million). After driving back to the hotel for breakfast, we then pay a visit to the sumptuous grandeur of Agra Fort. Once the capital of the mighty Moghal Empire, the city is littered with some of the country's most opulent and iconic buildings and the sandstone majesty of its imposing fort is no exception. Built by Emperor Akbar and then embellished by his grandson, Shah Jahan, the fort was once a great city, with palaces, mosques and halls all lying behind the protective embrace of 20m high walls. Once the home of the fabulous bejewelled Peacock Throne (until its removal to Delhi by Aurangzeb, the last of the great Mughal emperors) the fort's grandeur and importance has seen it inscribed on the UNESCO World Heritage List. After our visit there will be some free time to wander the city, perhaps taking in the rich elegance of the exquisite Itimad-ud-Daulah, a 17th century tomb built for the Emperor Jehangir's chief minister that mirrors the marble majesty of the more famous Taj Mahal (hence its rather apt title of 'Baby Taj). There is also a possibility of returning to the Taj Mahal, to watch the setting rays of the sun casting a golden glow across its marble splendour (optional). With a full day to explore the delights of this majestic city we will enjoy a guided tour this morning of the highlights of one of India's most important cultural treasures. We will start by viewing the exterior of the Hawa Mahal, the famous ' Palace of the Winds', whose extraordinary façade of red and pink sandstone towers some 5 storeys above the city streets. Built at the end of the 18th century its 935 windows were designed to allow the women of the harem to gaze out on the city scene below without themselves being seen, the openings affording the added bonus of creating a refreshing breeze (hawa), which kept the palace cool even in the hot summer months. This morning we will also visit the once mighty Rajput capital of Amber and its magnificent fortress. Lying at the mouth of a rocky mountain gorge, overlooking Maotha Lake, the fort is a stunning creation of white marble and red sandstone that contains a dazzling mix of Hindu and Muslim ornamentation, including the breathtaking mirrored halls of the Sheesh Mahal. It was from these towering walls that the Kachchawahas ruled over their kingdom for some 7 centuries, until its importance was eclipsed by nearby Jaipur. Today it presents visitors with a staggering insight into the opulence and grandeur of the Rajput rulers. This afternoon we will visit the remarkable observatory of Jantar Mantar, the fascinating creation of Maharajah Jai Singh II, which houses a collection of astronomical instruments that are capable of measuring time, predicting eclipses, tracking the stars and ascertaining the declination of the planets and also includes the largest sundial in the world, believed to be capable of keeping time to an accuracy of two seconds. Begun in 1728, the incredible collection represents the largest and best preserved of the 5 observatories that Jai Singh had constructed during his reign. Our other visit is to the opulent splendour of the City Palace, a stunning complex of gardens and courtyards that presents a rich fusion of Moghal and Rajasthani design and houses an armoury and a museum that is home to a dazzling array of costumes, manuscripts and inlaid grandeur. This morning we have some free time to explore the markets and winding streets of Jaipur before driving to the train station to board the overnight express to Mumbai, India's commercial powerhouse on the western coast. Made up of seven islands on the eastern edge of the Arabian Sea, Mumbai draws people from all over the country to its booming streets. As well as being India's largest city and commercial centre this is also the home of 'Bollywood', an industry that produces more films per year than any other city in the world. Its natural harbour made Mumbai an attractive prospect for the ruling British and it became a major centre of maritime trade upon the opening of the Suez Canal in 1870 and today it accounts for over 40% of India's sea going trade. After a chance to freshen up we will take a sightseeing tour of the city this morning, viewing the honey-coloured Gateway of India arch and the macabre Towers of Silence. Built by the Parsis fleeing persecution in Persia during the 17th century, the Towers were a mortuary for the dead. Being Zoroastrians the Parsis were not allowed to bury or cremate their dead, so instead they were deposited in these towers to allow nature to dispose of them. We also visit the municipal dhobi ghats and the Prince of Wales Museum, which has an excellent collection of Indian miniatures from the Moghal and Rajasthan schools, whilst at the Mahatma Gandhi Museum we'll learn a little of the great man's life and ideas, through an impressive collection of books, photographs and letters. Departing the city early this morning we travel by train to Goa, following the Konkan Railway to the station at Thivim. Journeying along this line affords us an opportunity to truly appreciate some of the most spectacular scenery offered by any of the Indian rail networks as we pass through the staggering scenery of the Western Ghats. The palmfringed shores of Goa were colonised by the Portuguese in the 16th century, who captured the original Arab trade settlement and began building a city on the Arabian Sea strewn with houses, gardens monasteries and churches, many of which unfortunately no longer remain. Goa eventually became the commercial centre for East and West, where merchants could buy pearls, coral, rubies, golden jewellery, silks, China porcelain, lacquered furniture, ambergris and exotic spices. The Portuguese influence is still very much apparent - the main religion is still Roman Catholic and siestas are still widely practised in the hot afternoons. Like most areas in India, Goa also has its own food specialities, the most popular being pork vindaloo! You may also want to sample the locally brewed spirit feni - a spine-tingling drink made from coconut or cashew apples. We have a relaxed start to the day with the morning free before we meet in the afternoon and take a walk around the city of Panjim. Whilst Goa is mainly known for the beaches that tempt tourists throughout the year, the wide streets of Panjim are worth exploring. The buildings are distinctly European in style with shutters, balconies and red tiled roofs although they are mixed in with more traditional temples to create a rather unusual style. If you wish to spend some time on the beach it is just a short taxi ride away. After breakfast this morning we will drive to a local spice plantation, to learn a little of the spices and plants that grow amongst these fertile landscapes. This part of India has long been famed for its abundant array of spices; indeed Christopher Columbus was en route to the spice rich Malabar Coast when he bumped into America by mistake. A tour of the gardens with a local guide will reveal the vast wealth of Goa's aromatic treasures, including pepper and nutmeg, vanilla and cinnamon. This afternoon we will transfer to the station for the overnight train to Bangalore, travelling across the historically rich province of Karnataka to its south-eastern border with Tamil Nadu. Founded in the early years of the 16th century Bangalore went on to become an administrative centre under the British during the 1830s and today can boast one of India's most vibrant economies, having taken on the title of the country's science and technological centre. Arriving in the city early this morning we will take time to freshen up after the train journey and take breakfast. We then continue by road to Mysore, a city which today is famed for its silk and sandalwood. Transferring to the hotel on arrival, we will have some time to relax this afternoon. Today we visit the sumptuous grandeur of the Maharajah's Palace and the enormous monolithic sculpture of the sacred bull, Nandi. Originally built in the 14th century, the palace has undergone two subsequent re-buildings, the most recent being in 1912 when the palace was redesigned by the English architect Henry Irwin, and is today an opulent mixture of Hindu and British architecture. Filled with stained glass, mirrored halls and an eclectic array of ornate furnishings and vibrant colours, the palace's interiors are a fascinating mix of the elegant and the gaudy, with beautifully carved doors and mosaic floors sharing space with vividly painted pillars and overly ornate furniture. The Chamundi Hills overlooking the city are home to the towering Sri Chamundeswari Temple and the 5m high representation of Shiva's sacred bull, Nandi, which was carved from a single piece of rock in the 17th century and is one of the largest in the country. The afternoon is free for personal exploration. After a free morning to relax we take the short drive to Bandipur National Park. The park was established in 1974 as a tiger reserve under 'Project Tiger', once a private hunting reserve the park is now known for it's diverse wildlife. This evening there will be a short lecture at our jungle lodge on the wildlife in the park. An early start this morning as we take our first game drive in search of the mighty Bengal tiger. We will also take an afternoon game drive to increase our chances of a sighting. The park is known for having a significant tiger population and along with neighbouring parks cover an enourous area in southern India. As well as tigers you can hope to spot herds of wild elephants, gaur and wild boar as well as an impressive array of birdlife. Today we head towards Tamil Nadu and the most famous of all South India's glittering hillstations. Ooty (or Udhagamandalam to give it its full title) was established by the British in the 19th century, as a summer retreat for the Madras Government amongst the cooler climates of the Nilgiri Hills. We arrive amongst its forested landscapes in time to enjoy some free time this afternoon to take in something of its genteel charm. You may like to visit the Botanical Gardens, or perhaps enjoy a round of golf, visit the historic old church of St Stephen's (the oldest in the Nilgiris), or maybe pay a visit to a local tea factory. Those looking to stretch their legs might like to consider a walk up to Dodabetta Peak for some spectacular views out across the countryside. Visiting Fort Kochi with a local guide this morning we get a better view of some of the city's rich fusion of divergent styles. Fort Kochi is the oldest European settlement in India (1500), with a mix of English, Dutch and Portuguese architecture. During our tour we will visit the Jewish Quarter and its surviving synagogue, the church of St. Francis where Vasco do Gama was buried for a while and the Basilica of Santa Cruz. The Mattancherry Palace was built by the Portuguese in the 16th century, but extensive renovations by the Dutch some hundred years later earned it the name 'the Dutch Palace' and today it houses some of the best murals in India, depicting scenes from the Ramayana and other great legends. There will also be time to wander through the fish market and see the interesting cantilevered Chinese Fishing nets before the chance to continue exploring on your own. There is the option of taking a ferry across to nearby Ernakulam, or perhaps visiting the sumptuous grandeur of the Tripunithura Hill Palace, the impressive former residence of the Maharajahs of Kochi. As well as being the oldest European settlement in India, Kochi is also home to the famous Kathakali dance, thought by some to be the very essence of the culture of Kerala, portraying as it does events from the great Indian epics of the Ramayana and Mahabharata. Its origins may have come from traditional temple rituals and from an art form known as Koodiyattam. It is the face make up which makes this dancing so unique and dancers can take up to three hours painting their faces - the features are heavily emphasised as it is the facial expressions and co-ordinated eye movements which are important in the dance. This evening there may be an opportunity to view one of these remarkable performances for ourselves (optional). After breakfast this morning we drive to Alleppey, to board a houseboat to enjoy some time exploring the labyrinth of canals and channels that make up this captivating region, the perfect way to observe the everyday life of the villages of the backwaters. Boat styles are very much adapted to their environment here and on the more open canals you can often see boats with large sails, their bows carved into the shape of stylised dragons. Boats are a vital lifeline for the villages and an integral part of the social structure of the region. They act as taxis and school buses, deliver the mail, and even collect the harvest. You may see great pyramids of coconuts or even the odd buffalo being carried along in this time honoured fashion! In days gone by these waterways were once the scene of post-harvest water wars, which have now evolved into great water pageants that take place on Lake Vembanad each year. A celebration of Kerala's seafaring traditions, these 'snake boats', which reach over 30 metres in length, are crewed by up to 100 rowers, including teams made up exclusively of women. Along the narrow channels the industrious villagers survive on narrow spits of land, keeping cows, pigs, and chickens and cultivating vegetable gardens. Even the shells from the fresh water mussels are burnt to make building lime, and coir is used for just about everything it seems. There is considerable variation between the different regions of India but, in general, the climate is tropical. Summer temperatures on the plains are very hot, but cooled by the South-West Monsoon, which lasts from June- September. During these months it can be very wet and therefore very humid. At altitude, temperatures can become quite cool at night even in the summer and may drop below freezing between December and February so warm clothing is necessary. In the winter, northern and mid India can be very cool, with cold evenings, so warm clothing, including plenty of layers, are essential. The south of India remains warm and sunny during the winter months. In general only lightweight clothing is needed during the day, but bring some warm clothes for winter mornings and evenings (November to end February) in the north and for early morning game drives in Bandipur (especially during December and January) a windproof jacket, warm layers, gloves and hat are also recommended. Often hotel heating arrangements in North India are not on a par with UK standards and from December to February thermals are also recommended. Casual clothes are the most practical: tight fitting garments, brief shorts and skirts should be avoided, since they attract unwelcome attention. Waterproofs and or an umbrella may be useful in October and November. One main piece of baggage and a daypack. We recommend a holdall or rucksack for ease of getting on and off trains and please remember, you are expected to carry your own luggage so don't overload yourself. A torch, water bottle, good quality sunglasses, insect repellent and high factor sunscreen are all essential. You may also find binoculars a bonus for the game viewing. Accordingly you should allow approx. £45 for gratuities for local staff. Indian Rupee Recently new 500 and 2000 rupee notes have been bought in to circulation and as the old notes are no longer accepted there have been some cash flow issues. You don't need to worry about being given old notes as it's very easy to tell the difference, the new notes are pristine in comparison with most Indian money which is fairly tatty. GBP/US$ are the best currency to change into local currency. The Indian rupee is a restricted currency and it is best not to obtain in the UK as rates are very poor. You can either change money at the airport on arrival or in major towns during the tour. Your Tour Leader will advise you on the best places in each town. Both GBP and USD cash are easy to exchange at the airport and at hotels however you will be restricted to changing £60 cash at a time and it's not possible to change money at these locations using a credit or debit card. ATMs are available in most large cities in India but they are very limited elsewhere so please do not rely on this. Very rarely, only in the larger outlets. Opportunities to exchange are limited. Accommodation in India is as varied as the country itself. On our tours we stay in a mix of hotels, heritage properties, camp sites and homestays. Standards do not equate to standards in the UK and it's best to approach each type of accommodation with an open mind. Service can be slow in places especially when travelling with a group. For the most part hotels do not have heating so in the winter months it can be chilly and if you feel the cold you may wish to ask for extra blankets. Hot water is not always available 24 hours a day in some of the smaller properties, and with a group staying you might find if you are showering last you may miss out on the hottest water. India: Holders of passports endorsed 'British citizen' may be eligible for the e-Tourist Visa to enter India. You must be arriving into one of 24 selected entry points which can be found via the official Indian Government website link above. However, you can exit from any of the authorised immigration check posts in India. Passports must have at least 6 months validity from the date of arrival in India and at least two blank pages for stamping. The visa application will take approximately 4 days to process. It is valid for 60 days from the date of arrival in to India, and double entry is permitted on the e-Tourist visa. You can only obtain 2 e-visas for India in a calendar year. The visa costs approximately $100, however these costs are subject to frequent change so you should check on the official Indian government visa website mentioned above. Biometric data will be collected on arrival in India. Whilst the online form offers a relatively quick way to apply for a visa, a number of applicants have reported difficulty in completing the form. Travcour will complete the on-line visa on your behalf for a fee of £30 + the visa cost. Please contact them directly if you wish to take up this service. If you are not eligible for the e-Tourist Visa, please refer to VFS Global to apply for your Indian visa - http://in.vfsglobal.co.uk/how_to_apply.html. Nothing compulsory, but we recommend protection against Tetanus, Infectious Hepatitis, Typhoid and Polio. Please consult your travel clinic for the latest advice on Malaria, Dengue and Zika Virus. Please check the latest requirements with your travel clinic or doctor prior to departure. The above is not an exhaustive list. Further information regarding vaccinations and travel health advice can be found by following the NHS and NaTHNaC links at Explore Travel Health and from your local healthcare provider. Visa and vaccination requirements are subject to change and should be confirmed by you before travelling. Travelling on an Indian train is a fantastic experience, with millions using the rail network every day it is the perfect opportunity to meet local families. For all the train journeys on our trips, we will reserve your seats/berths in advance in 2nd class with air conditioning. Whilst we'll try to ensure the group is all together, due to overwhelming demand and the system for booking train tickets in India, it may not always be possible to have everyone in the same carriage and some reservations may be in 3rd class. In such cases our Tour Leaders will help everyone to find their seats and ensure you get the most out of your journey. For overnight trains, each berth is separated by curtains and has 4/6 bunk beds. Bedding (sheet, blanket and pillow) is provided but you may wish to bring your own sleeping liner for added comfort. Train travel in India is safe and civilised but for added security whilst you sleep it may be a good idea to bring a bike lock for your bags. If you do not wish to carry one with you, your tour leader can help you to purchase one locally before your train journey. Please note that in January train journeys can sometimes be affected by fog. This may result in some last minute changes to the itinerary. In this eventuality we will endeavour to stick to the itinerary as closely as possible and will cover any extra costs incurred. In order to make reservations on Indian trains and guarantee the smooth operation of your trip, we require your full passport details. It is important that we receive these details as soon as possible so we are ready to make the arrangements as soon as train tickets are available to buy. 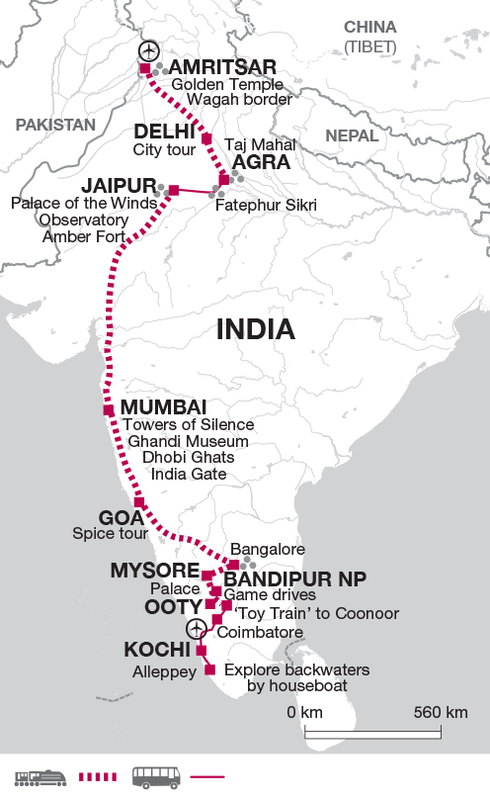 Travelling from Amritsar in the north to Kochi in the south this tour is ideal for anyone wanting to experience India's incredible rail network. Train travel in India is the perfect time to meet the locals, who are always interested in where and why you are travelling. This tour is packed full of experiences so ideal for those wanting a busy itinerary.